Dr. Farida Faheem passed MBBS from Government Medical College, Aurangabad, Maharashtra, India in 1996 November. She had an experience of 22 years as a General Practitioner. 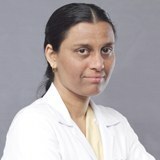 She has worked in Municipal Corporation Hospital, Maharashtra, India and also had private practice in India. She has been working in NMC specialty hospital, Dubai, U.A.E in Emergency Department from 2012 and in inpatient department since 2015. She can speak English, Hindi, Urdu, Marathi, Gujarati and working Arabic.